WT Henley Heavy Duty 4 Pole Insulated Cut-outs are suitable for low voltage cable termination of stranded or solid, copper or aluminium conductors, 95-300sqmm. WT Henley heavy duty 4 pole cut-outs are insulated and designed to accept BS 88 "J" type fuse links. 200/300amp and 500amp rated WT Henley heavy duty cut-outs are available. Pictured : WT Henley Single Pole Heavy Duty Cutout. The cutout is shown terminated with 300sqmm stranded aluminium conductor within incoming mechanical connector. Cable entry/exit from the cutout is via a PVC grommet, hence the heavy duty cutout is ideal for limited work space installations. 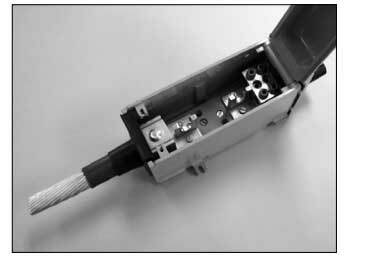 A three-cable entry position-sealing chamber is available. Incoming cable termination is available via double shear bolt mechanical connector, 95-300sqmm conductors. T&D also offer alongside WT Henley a range of House Service Cut-Outs 240V 415V CNE & SNE. WT Henley Low Voltage Fusegear range includes house service cut-outs, insulated connector boxes (Henley Blocks), heavy duty cut-outs, ABC boxes, overhead service cut-outs, fuse carriers, solid links, rising service boxes, multiway service heads, multi-service pillars, street lighting cut-outs and miniature circuit breakers. T&D supply the complete range of WT Henley Cut-Outs including Heavy Duty Cut-Outs, House Service Cut-Outs and Pole Mounted Cut-Outs.